THE B-MOVIE NEWS VAULT: The Killer Shrews have returned and are schlockier than ever! The Killer Shrews have returned and are schlockier than ever! SPREAD THE WORD AROUND.... THE KILLER SHREWS ARE BACK IN TOWN THIS SEPTEMBER! I was contacted recently by Ken Cosentino, the man behind a remake of 1959's THE KILLER SHREWS! The aptly titled ATTACK OF THE KILLER SHREWS is due out later this year on DVD, and will be a loving parody of the low-budget classic that many of us first witnessed on MST3K! For more info on this new film, read the press release below. "For the past two years, Niagara Falls based White Lion Studios has been cooking up something awful: A splatstick remake to the 1959 cult classic THE KILLER SHREWS, a low budget creature feature made popular by Mystery Science Theater 3000. The original film, directed by Ray Kellogg and starring James Best, is best known for it's schlocky monster puppets and dogs in costumes. "We did our very best to stay true to the original," says writer/director Ken Cosentino, "Our puppets are really quite terrible and there's hardly any CGI used in our version." Cosentino has worked as a hired gun for companies such as Troma (RETURN OF NUKE 'EM HIGH VOLUMES 1 & 2) and The Asylum (ATLANTIC RIM). This is his fourth feature film as director. The remake stars Bill Kennedy and Elizabeth Houlihan, as well as newcomer (to acting), legendary animator Jonathan Rogers (aka John Leach). At 78 years young, Rogers promises to steal the show with his physical comedy. The film also includes a special introduction by Lloyd Kaufman, the creator of "The Toxic Avenger." ATTACK OF THE KILLER SHREWS is slated to be released this September by White Lion Studios. Says Cosentino, "We decided from the very beginning to distribute it ourselves. We really want to make sure that it finds it's audience.... b-movie lovers and fans of the original, because this is a love song to Kellogg's cult classic." For more information, please visit the film's official website at www.KillerShrewMovie.com, and the Official Facebook Page!" Please note Vault Dwellers, that yes, there is in fact a low-budget sequel to the original Ray Kellogg film called RETURN OF THE KILLER SHREWS (with James Best reprising his role from the 1959 classic). It has nothing to do with this movie! 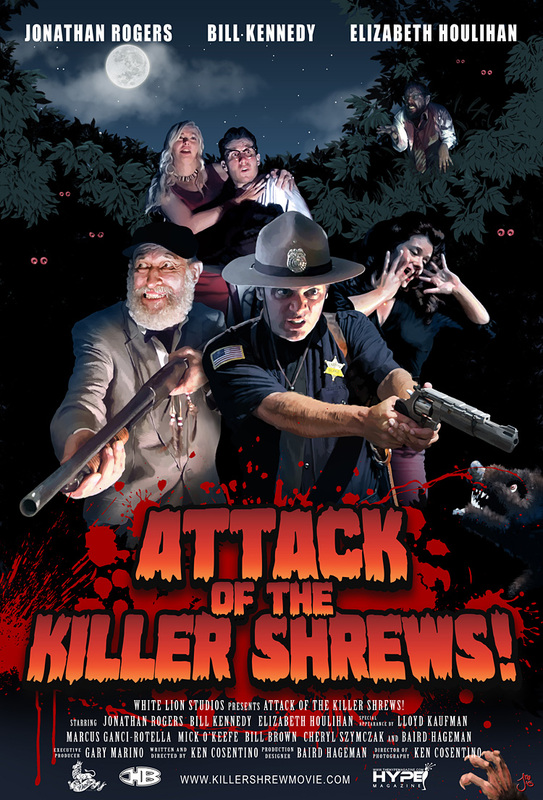 Watch the trailer for ATTACK OF THE KILLER SHREWS below, and stay tuned for more updates!